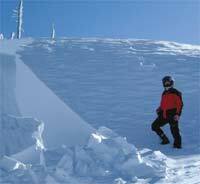 Snowmobiler Jim Kozak poses in February 2003 at the large end of a slide at Echo Bowl in the Selkirk Mountains. Decisions, decisions. Anyone venturing into the backcountry this winter should be mentally prepared to make critical decisions. Backcountry trekkers need pinpoint avalanche knowledge to answer these questions with certainty, and, fortunately, there are several places in northern Idaho that offer assistance and, occasionally, classes. The Idaho Panhandle Avalanche Center is part of the U.S. Forest Service and offers public avalanche awareness workshops for clubs and groups as well as weekend avalanche forecasts. In Sandpoint, phone (208) 265-6686; or call (208) 765-7414 in Coeur dAlene or (208) 245-6209 in St. Maries. The avalanche hotline is (208) 765-7323 or toll free: 1-866 489-8664. You can also visit www.fs.fed.us/ipnf/visit/conditions/backcountry for updates. Another good source is the Priest Lake State Park at (208) 443-2200. The Snow School in Sagle sponsors 10-hour-long avalanche rescue workshops and Level 1 avalanche classes; phone (208) 263-3552 or look up www.thesnowschool.com. For those who want one-on-one instruction, Dan Krmptich of Bonners Ferry is a CAA Avalanche-certified mountain guide and can be reached at (208) 267-8875.